I wonder if any of you can help me? 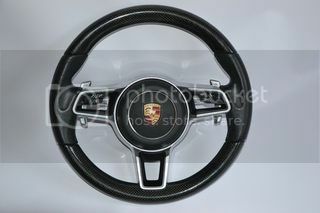 I have bought a Macan multi-function paddleshift steering wheel with airbag to install in my 997 gen 2 C4S and wondered if any of you had got it working. I already have a multifunction PDK button steering wheel and was wondering if a wiring harness would be required to make the multifunction work with the PCM? I can confirm that the adapter above works - have it installed in my 997.1 Turbo with a Macan wheel. Thanks guys, though the site is a little confusing regarding which wire loom is required. Can you confirm which is required for the Macan wheel? It doesn't have the little wheel for sports plus etc, but paddles and multifunction. I think the STMV1, but best to send them a message and confirm. They’re very responsive via Facebook.